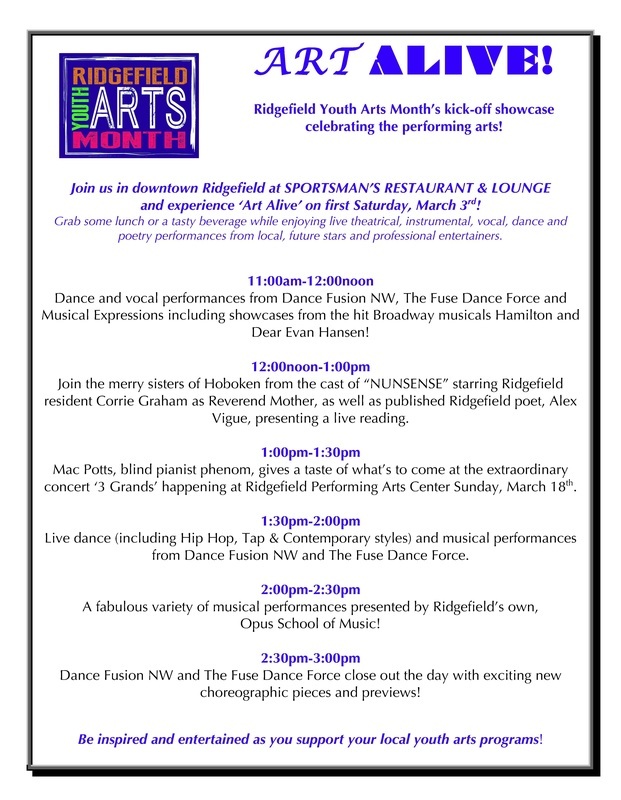 Ridgefield will be buzzing on First Saturday, March 3rd as performers and artists converge downtown to help kick off Ridgefield Youth Arts Month with two exciting events sure to entertain and engage. At 10:00 am, the Ridgefield Community Center comes alive with creative art opportunities for kids of all ages (and adults too!). “Express Yourself!” offers hands-on art activities featuring Ridgefield Art Association and Ridgefield School District artists and staffers. Engage in even more activities at the Art Bar sponsored by the Ridgefield Library or grab a paintbrush and add some colorful inspiration to Ridgefield’s first-ever Community Mural. Across the street at Sportsman’s Restaurant & Lounge, check out “Art Alive!” starting at 11:00 am – a showcase celebrating the performing arts. Watch live theatrical, instrumental, vocal, dance and poetry performances by local and future stars and professional entertainers. Mac Potts, blind pianist extraordinaire, will perform at 1:00 pm, providing a preview of the upcoming “3 Grands Concert” on March 18th at RHS Performing Arts Center, where he will perform with two other award-winning, blind pianists, Nick Baker and Brent Gjerve. Be inspired and entertained! Join us on First Saturday, March 3rd for a day of engaging fun, creativity and entertainment to celebrate and support local youth art programs in Ridgefield.